"Utterly Simple Spelt Bread made without yeast, so you won't have to wait all day to enjoy fresh bread." In a large bowl, mix together the spelt flour, sesame seeds, salt, molasses, baking soda and milk until well blended. Divide the batter evenly between the prepared pans. Bake for 1 hour and 10 minutes in the preheated oven, or until golden. Placing a tin of the same size over the top of the loaf while baking gives it a lovely crust. This bread lives up to its name! Very easy to make, and quite tasty! I omitted the sesame seeds and used honey instead of molasses. Good stuff. Thanks for the recipe! 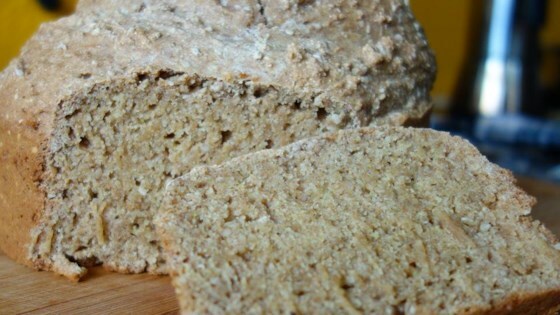 Very good and easy bread to make. I substituted honey and almond milk. It came out great. Thanks! I love this...I made it once with sesame seed and once with flax seed and I prefer the flax seed. I also used a mini loaf pan and baked them for 30 minutes. Just wonderful!